It's been a while since I have reviewed Pocky, so here is a snazzy flavor new flavor that was released this summer. What is "Rare Cheesecake?" Some kind of fancy hard to find cheese? Nope, it's actually a no-bake cheesecake, so the "rare" refers to being uncooked like a rare steak. We have no-bake cheesecakes here in the states as well, but the ones served in Asian have a very different taste. Cake may vary, because all bakers make everything a little differently, but rare cheesecakes can taste very, well, cheesy. In America we tend to prefer a standard cream cheese flavoring for the base but Asian cheesecakes can occasionally have a truly cheesy taste with strong lemon flavoring. Again, it varies from bake shop to bake shop, but you might get something that tastes completely different from the standard, American, cheesecake. The packaging is a little boring when compared to the other fancy Pocky packages I have photographed, but it's not half bad. 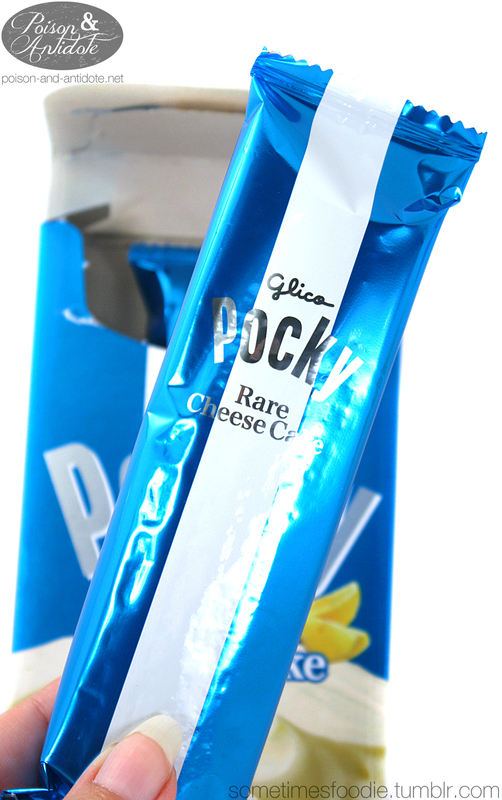 Overall the box is a shiny metallic blue color with lemon slices, Pocky sticks, and a whipped cheese-y filling in the background. It isn't unappealing, but I don't exactly like the color choices and layout for this box design. Glico has done much better packaging in the past. 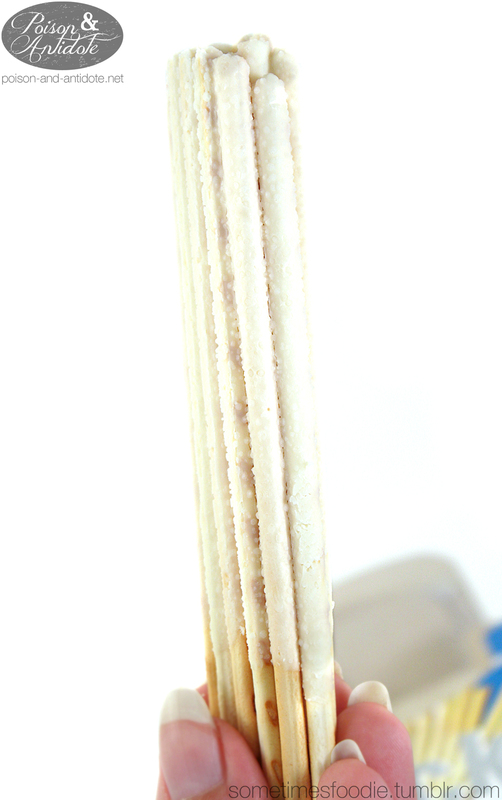 When I opened the box I found out that all my Pocky sticks had melted together into one super-Pocky. It was a hot day when I bought this and I took the train home, so I kinda knew this would happen, but I could easily separate some sticks to be photographed. It didn't seem to effect the taste of the product, but it did mess up my photos a bit. 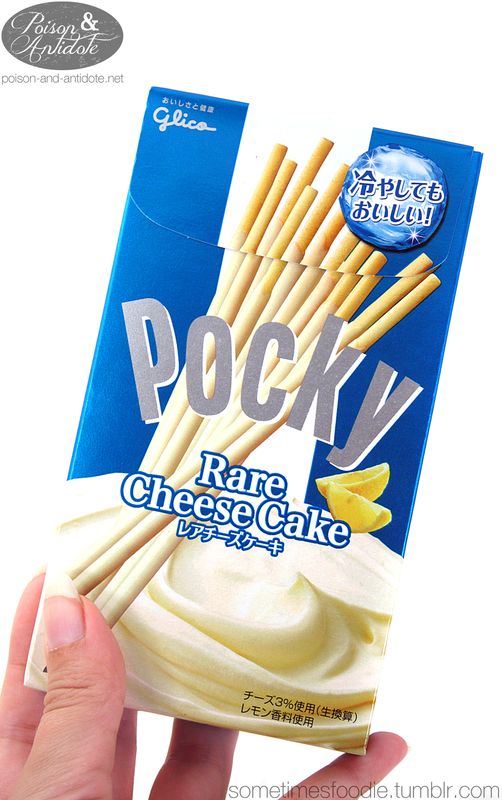 This Pocky smells like cheese. It isn't a cream-cheese aroma. It's more like Parmesan. There is a hint of sweetness to the scent, but overall it smells more like a savory cheese than a dessert. 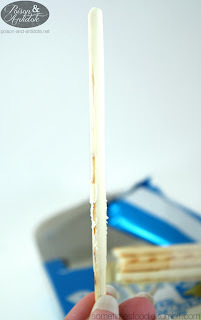 It starts out tasting sweet and lemony, but as you chew you get a delightful Ricotta or Marscapone-like cheese flavor. Overall this is a very authentic, and yummy, recreation of a delicious dessert. This is like eating a yummy dessert but with less calories and a lighter flavor. If you're a fan of cheesecake you owe it to yourself to try these.